The AV Workstation is set up for use in audio, video and graphical work. 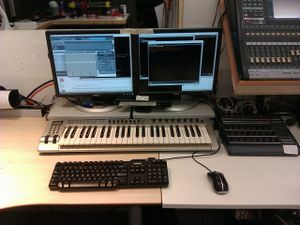 There are 2 DVI monitors and a number of multimedia peripherals attached and the machine is connected to the Yamaha mixer for audio input/output. It is currently running Ubuntu Studio. Currently we are using the 'techinc' user account. The password the one you were told already, but it should auto-login to the user on bootup. Please suspend the machine when not in use. This page was last edited on 15 February 2017, at 02:49.